An engine is like the heart of any car, truck or SUV. Like a heart, it requires regular checks and occasional repairs. Additionally, it also takes an experienced, trained professional with a keen eye and a steady, firm hand. 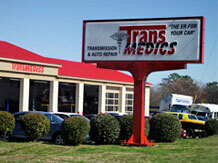 At TransMedics, we are the ER for your car! There’s no other auto shop in the Raleigh area that can provide your car’s engine with the same high level of care and quality quite like our team. We provide unparalleled service for engines throughout North Raleigh and beyond, including engine repair, routine engine maintenance and so much more! If you’ve hopped in your car before work and tried to start it, only to find that it won’t crank, you unfortunately know exactly what we’re referring to. Sure, it could be that the battery needs to be replaced or that the fuel pump is bad — but it could also be a sign that your engine is crying out for help. “Check Engine” Light On? Bring It to Our Raleigh Mechanics! No other auto shop in the Raleigh area will care for your car quite like our team of experienced mechanics. Remember, our basic diagnostic is 100% free of charge. If your “Check Engine” light comes on, bring your vehicle to TransMedics on Old Wake Forest Road! We proudly serve customers from Raleigh, Wake Forest, Rolesville, Knightdale, Durham, Cary and all surrounding areas.